HOME / TRENDING / #JUSTICEFORSUSHANT: AMITY LAW STUDENT COMMITS SUICIDE! WHO IS TO BLAME? Sushant Rohilla, a third year student from Amity Law School, Delhi committed suicide at his Sarojini Nagar residence in Delhi. The college is to blame! Sushant Rohilla, a cheerful and proactive boy was a defaulter to his college administration. Rohilla had low attendance and was thus debarred from appearing for exams. Sushant realized the gravity of the situation and thus, wrote an email to the administration begging them to consider his plea on medical grounds as he had suffered a foot injury. But this email sent by Sushant fell on deaf ears. For a student as dedicated as Sushant Rohilla, being barred from exams was a cause of great mental stress, as is indicated by Sushant in his email to the college authorities. In his suicide note, he reportedly wrote he was a failure and did not wish to live. Responding to the controversy, Savita Mehta- Vice-President, Communications, Amity Group, told IndianExpress.com, Sushant had 43 per cent attendance and his parents were repeatedly informed about it over emails. “We had sent emails intimating them that his attendance is very short and he won’t be allowed to sit in the exams,” she said. He was just a happy soul, he indulged into everything a millennial would: played Pokemon Go, read online articles, online shopping, shared memes, binge-watched sitcoms. Sushant was an excellent student. He was the President of the Debate Society, he also organized various festivals and competitions in the college, he helped organizing the Eco-fest, he himself was a commendable mooter and also helped organize various moot court competitions in the college. Friends of Sushant and students of the college claim that the incident can be directly attributed to the misadministration of the college and the mental harassment done by them. His father Jagdish Kumar, a joint secretary in Rajya Sabha, blamed college officials for his son’s suicide. “His act of suicide was provoked by some officials of the Institute over trivial but illegal arbitrary issues. No student should ever be tortured over attendance. No student should ever be compelled to ever contemplate such a step. I will get my son justice,” he wrote on Facebook. A few days later, a fellow student of the Amity Law School, Teerth Waraich, took to Twitter to reinstate the claim that Sushant had been barred from examinations unfairly. AIB’s Rohan Joshi shared a heartbreaking personal experience of a similar nature after reading about Sushant, in which he explains one of the major reasons he dropped out of his engineering college was a teacher who didn’t treat him well. Comedian Aditi Mittal also spoke for the cause. 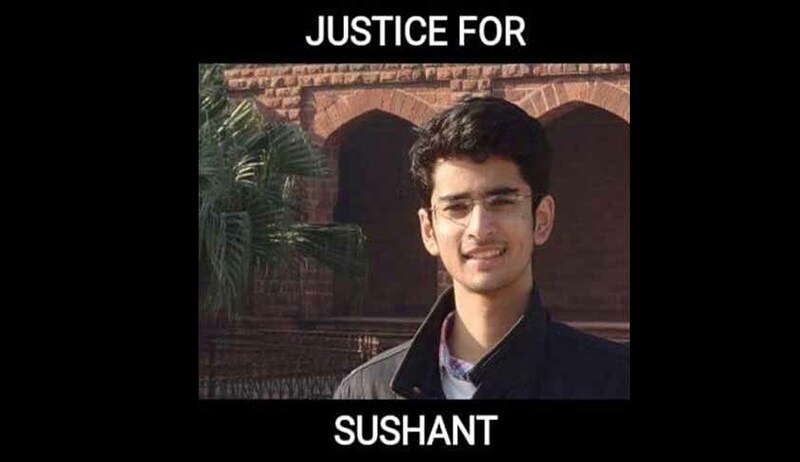 And the students of Amity Law School, Delhi come up with a manifesto too, seeking justice for Sushant! Meanwhile, Amity Law School, Delhi expresses sadness but claims it had absolutely no role in student Sushant Rohilla’s suicide! Is this what our education system has come to? Attendance over the value of life?